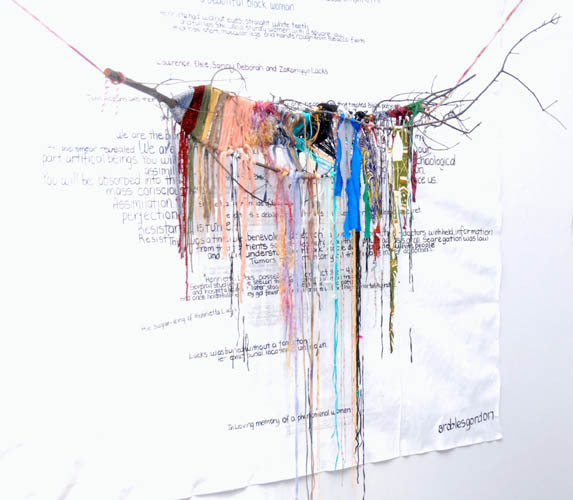 Hennie Made Life Come Alive, installation, consists of three branches woven with fabric: The sugar-icing of Henrietta Lacks, Discovering HeLa, and The Renaming of the Immortal. Each branch is positioned against either a 5 x 5 ft square wall space or canvas, painted black or white with hand written text. Each canvas or wall space features text, a combination of my personal commentary, and factual information about Henrietta Lacks, the HeLa cells. and her family. I also include text in which refers to my personal experiences, and other modern references that speak to why Lacks's story is still relevant to the lives of black people and specifically the ill treatment of black women. Each branch is painted a particular color that corresponds with and represents an aspect (listed below) of Henrietta Lack's immortal cells and life. The sugar-icing of Henrietta Lacks, the black branch is referencing Henrietta's cancer diagnoses, Discovering HeLa, the white branch reflects the renaming of the her cells once they realized the value of her blood. The yellow branch, Renaming of the Immortal, is referring to the discovery of her immortal cells.